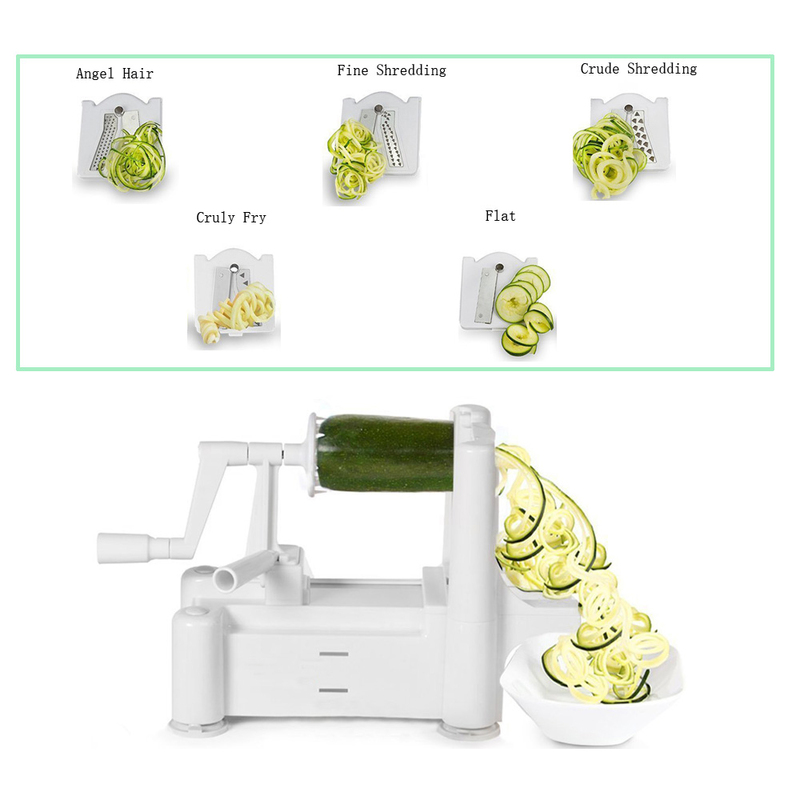 The 5-blade spiral vegetable slicer is the easiest and fastest way to tranform vegetables into gorgeous spiral slicer.Spiralizer with 5 styles of cutting blades, which allows you to use the appropriate blade you need for every cut style.Perfect for fruits/veggies like apples, onions, carrots, zucchinis, cucumbers, cabbages, beetroots, turnips, rutabagas,cucumbers, radishes, potatoes, sweet potatoes, squashes, and more. 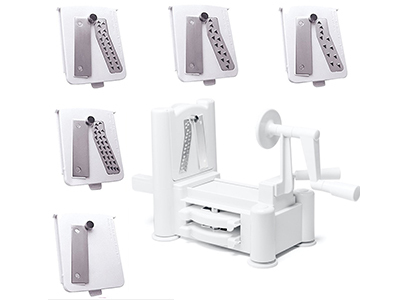 The ultimate tool for eating healthier.Best Veggie Slicer Spiralizer To Make Salad,Vegetable Noodle and Veggie Pasta Spaghetti.Vegetable Spiralizer with 5 styles of cutting blades, which allows you to use the appropriate blade you need for every cut style. 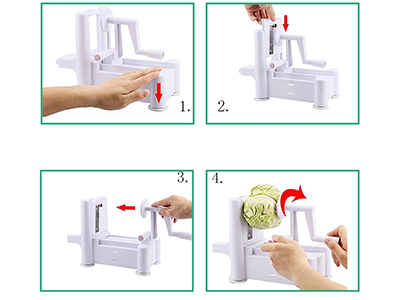 The 5-blade spiral vegetable slicer is the easiest and fastest way to tranform vegetables into gorgeous spiral slicer. Specializer with 5 styles of cutting blades. Perfect for veggies like onions,carrots, zucchinis, cucumbers,potatoes, sweet potatoes, and more. The 5 blades are made of stainless steel to ensure they will stay ultra sharp. The 5 blades are designed to make a wide variety of cuts. 2 additional blades (ultra thin 2mm angel-hair blade & curly-fry blade), for a total of 5 blades for all your spiralizing needs. 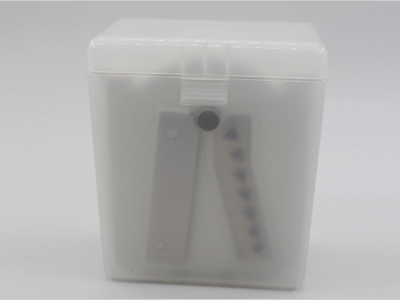 Extra blade caddy for safe storage of blades - no more loose blades that can go missing or cause accidental injuries . Designed to be easy to use, store and clean. Attach one side of the vegetable or fruit to the small circular corer on the blade plate and gently press the prongs onto the opposite end. Use one hand to push the lever handle along while simultaneously turning the crank handle with the other hand. 1.Does it work well for tough vegetables and fruits? The Veggie Spiralizer is strong and powerful enough to work well for tough vegetables and fruits such as potatoes and sweet potatoes.It also great for zucchini, squash, carrots, cucumbers and more. 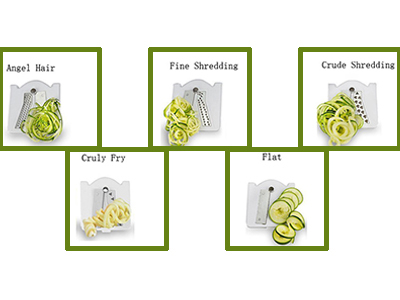 Spiralizer with 5 styles of cutting blades,which allows you to use the appropriate blade you need for every cut style.